1. Have you ever attempted to lose weight/get in shape before? If so when? How long ago? What did you try? Were you successful? Did you lose weight? Did you put it back on? 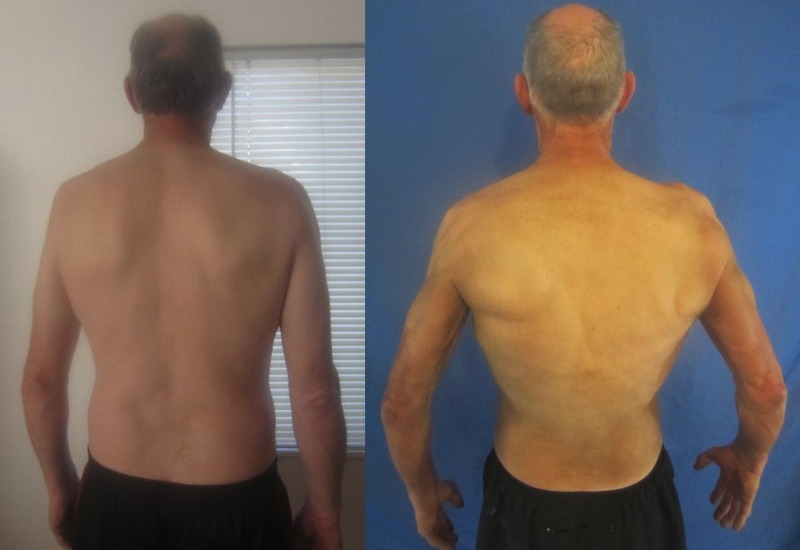 When I started the Adonis Golden Ratio [AGR] program, I was already part way through a weight transformation that I had begun back in November 2012. For the first six months, all I did was try to eat more of the healthy food choices and exercise. The problem was that I didn’t also cut back on the unhealthy foods I was also consuming. My blood pressure, cholesterol and other blood markers improved, but my weight was staying exactly the same even though I was doing cardio 3-4 times a week. 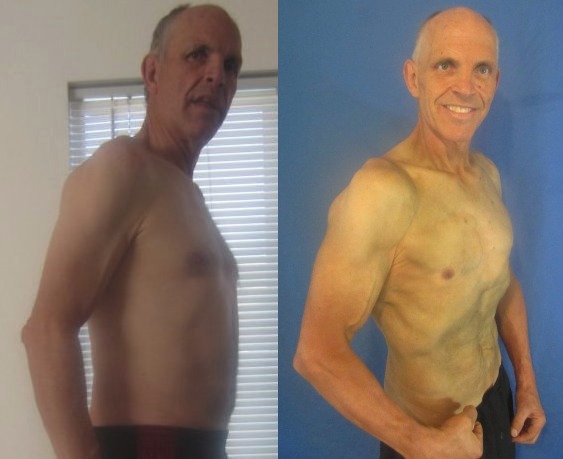 In April 2013 I decided to get more serious about diet and excluded bread, sugar and most processed foods from my diet without having any direction from a particular program, only a few suggestions from my wife who was following the Venus Factor program. I was fairly strict about my eating then and lost about 60 pounds on my own over about a year’s time. My wife purchased AGR for me in July 2013, but I wasn’t ready and didn’t take it serious until the contest began in January 2014. 2. What if any exercise programs have you followed in the past? Prior to doing the AGR program, I hadn’t lifted weights since high school. I had been active in my earlier adult life with a number of recreational sports, but gained weights as I aged and could no longer participate. The majority of my recent attempts at exercising involved solely cardio–mountain hiking, running bleachers and the stair mill in the gym. I was doing morning and evening cardio for up to two hours a day! 3. Any other diet/exercise philosophies you’ve attempted in the past? The only philosophy I had previously adopted was the idea of just solely eating healthy food without regard to amount. 4. How did you find out about AGR? My wife purchased it for me. When I wasn’t interested at first, my 21 year-old son used it successfully. Watching my wife with the Venus program, I noticed that she stuck with it longer than any other diet program she had ever tried in the past. Seeing her success in losing 100 pounds and keeping it off and winning the VT8 contest motivated me in seeing that I should look at the Adonis program because the Venus program was so successful. 5. What resonated with the Adonis message for you? The first thing that struck me was how practical the Adonis program was. I liked the idea that I could eat anything, but just needed to control the amounts. I had always thought exercise was my number one priority to get into shape, but now I realize how big a part of the equation is the calorie counting. I suspected that if I stayed within the suggested calorie amounts, I would be successful and that is exactly what happened for me. Though it wasn’t always easy, I stayed within my deficit and maintenance calorie numbers and was able to take a significant amount of fat off my body. 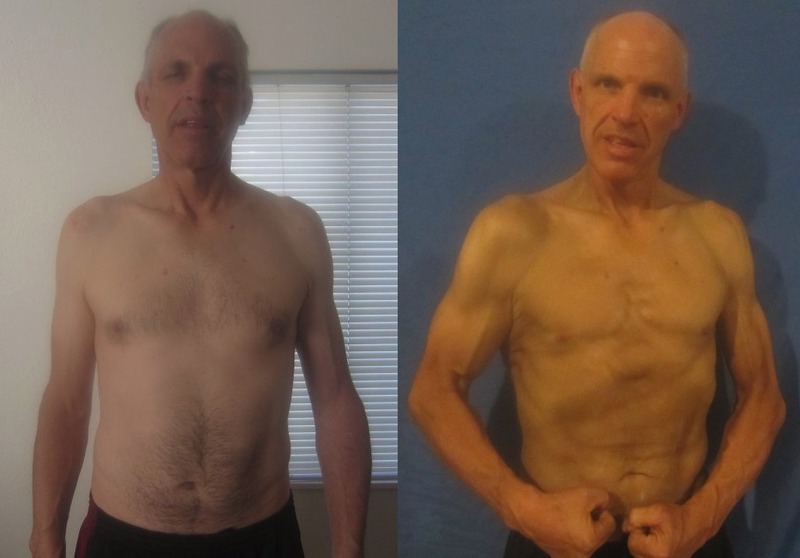 As I followed the weight loss/muscle building workouts to a “T”, I was pleased to see that I could actually build muscle at the age of 58! Even my adult sons commented on how buff I was getting! 6. What made you enter the contest? I had stalled out and plateaued in my progress and it motivated me to actually start using the Adonis program and get into lifting weights and counting my calories. I wasn’t where I wanted to be at weight wise, but more importantly, even though I had already lost a lot of weight, I didn’t look like I wanted because I lacked muscle tone. It was also motivating to me mentally to have the contest deadline. 7. What was it like going through the contest? Explain challenges you faced that you didn’t expect. It was a challenge for me to learn to be consistent and keep picking myself up when I would blow it and to have to then get back on the horse. I was very uncomfortable at first, being in the gym around people lifting weights. I didn’t even know how to use some of the machines. Over time, I watched the videos and learned the proper form and it became a lot easier and more comfortable. The worst part for me was taking the photos because it was something I had never done before and it was not my style to shave my chest, get a spray tan and get photographed with my shirt off. 8. What did you do for nutrition and how was our approach any different than anything else you’ve tried or heard of. I had never in my life counted my calories or even knew what a deficit or maintenance number of calories for my body size was. It was eye opening to know that some of the things that I was eating that were healthy were also very calorically dense. During my Adonis transformation, I learned to eat foods that were high in volume but low in calorie density, keeping me in a deficit, but satisfied. Before I just guessed. With Adonis, I knew that if I stayed within certain numbers I would lose fat. I have learned to enjoy what I eat and don’t feel deprived when I am eating healthy and in moderation. In fact, I don’t feel well when I overindulge anymore. Plus, I have actually learned to enjoy many vegetables. 9. What did you think of the Adonis exercise program and how did it work for you? My wife put my measurements in the calculator and it suggested I should start with Category 3: Muscle Building and Fat Loss. I thought it a very intelligently put together program and that it would be harder than it actually was. But I learned through doing that I could increase my intensity over time. I felt like the program I was on was just right for my starting capacity and, through the progression of the program, I had enough of a workout to get me where I needed to be to see my muscles progressing. For example, I had a shoulder injury in high school that was still bothering me when I began the program. I was able to work around that with lifting lighter weights in the beginning and progressing to heavier as my shoulders strengthened. My shoulders have now dramatically improved. 10. What advice do you have for new Adonis members who are sitting on the fence about a contest or are simply not sure if they can get to their goal? Don’t be afraid to enter a contest regardless of your age. 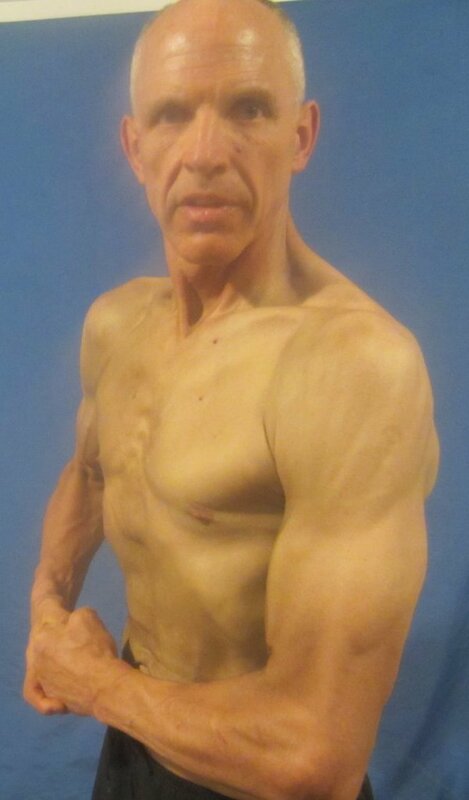 You can get in great shape and build muscle even when you are a 58-year-old man like me! Make focusing on the recommended calories and getting in the workouts a priority, but don’t freak out when life gives you setbacks. You will not be 100% perfect at it, even though we really try to be. Life is what it is. Get back on track right away and stay as consistent as you can! It really does become easier and a way of life. I still enjoy what I eat, but I eat in moderation now. Congrats on placing in this most recent contest. I distinctly remember getting your contest entry as it was under your wife’s name. Little did I know that you all would both later go on to earn Top 10 Placements in your respective Adonis/Venus transformation contests. A job very well done by you both. I enjoyed reading your interview and was also pleased to know that even your son was able to benefit from the AGR program. Most importantly, I believe your transformation was just as much mental as it was physical. You articulately explained the mental transformation you underwent as well as the challenges involved when it came to accepting the adherence to the calorie goal combined with learning your way around the gym. Overall, this was a family effort and I hope that you all continue on the journey towards your “Golden” ratios!